The CEO of Pebble says the popular smartwatch is only going to get better, as more features are unlocked and the next wave of apps arrive on the platform. Speaking at the Engadget Expand event in New York, Eric Migicovsky revealed the Kickstarter phenomenon has "hidden functionalities" that'll be made available in due course. When asked whether there's already a second iteration of the hardware in the works, Migicovsky said, there's still plenty of life in the current device, which raked in over $10m on the crowd-funding site. "Right now we're focusing on the platform that's already on 190,000 wrists around the world," he said. "The hardware's already there, and has a lot of hidden functionalities that we haven't even unlocked yet." Migicovsky also revealed he's said he's betting big on third-party developers building apps for the device and said there's already "tons on the way"
"We're a small company. We decided to put most of our effort into the framework and underlying structure that'll let other people build apps on top of it," he said. 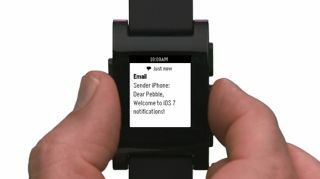 So, it seems good times are in store for Pebble fans. Just this week it got a whole lot more useful for iOS 7 users as it now plays nice with the Apple Notification Centre. You can check out the rest of the 20 minute video interview over at Engadget. In other news, the Galaxy Gear has been so poorly received that one retailer is now giving the thing away.